That’s awesome man, love it! 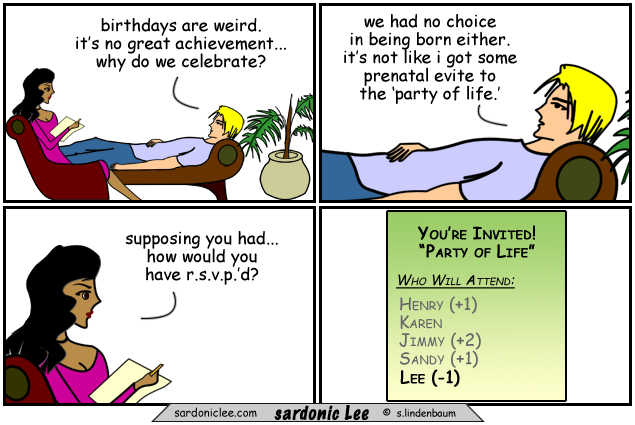 I think I would RSVP as well, Happy B-day! where’s bro in law ‘rock’ ((-2) + 3) on the attendance list? Happy Bday dude, miss ya. minus points?! hehe…. HAPPY HAPPY BIRTHDAY!!!! wish i was there to celebrate with you guys! Love the title–hope you got lots!!!! Or…. “Ok, Ok, i’ll go see your annoying band. Just put me on the guest list -1”. Brilliant idea! Hopefully you’re writing your bucket list. Put me on +1. Some seriouslee “negative” thinking … Hehehe.